Mini body size is just a little larger than iPad. Multi-interface works with a lot of devices like television, TV BOX, DVD, Laptop PC, USB driver, PS3/ 4, XBOX and Chromecast etc. That is perfect for Home Theater. The core components for a projector is the lens. It helps to transfer the light, make sure decent brightness and enhance the high quality color expression. 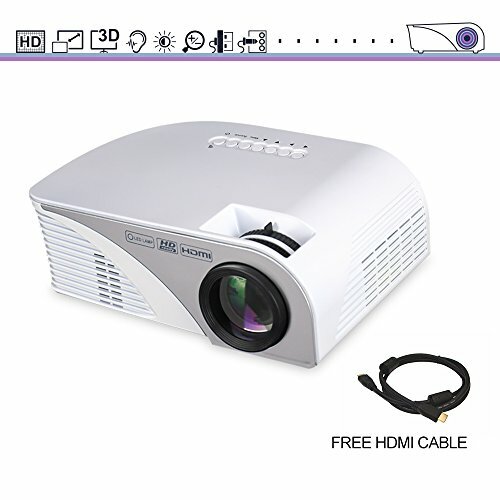 This video projector comes with 4 pieces of glass and 2 pieces of resin lens, high antireflection coating lens of this projector enhance the rich color and light transmittance. - Dual Stereo Speaker - 2 x 2W, with 3.5mm audio output for external speaker. - Image Size (Diagonal) 20-80 inches from 1.18-2.28 meters, the best size 50 inches from 2 meters. Mini HD Movie Projector. Glass Lens & LED Projector. 4 pieces of glass and 2 pieces of resin lens makes one high anti reflection coating lens with LED Bulb that delivers about 25% more brightness . 800*480 native resolution, supports 1080p; 15 degrees vertical, Manual Focus and Keystone correction delivers a perfect projection every time. Image could be reversed 360°. And it comes with a FREE AV Cable and a FREE HDMI. Portable Size & Big Cinema Screen. The latest model of iRULU Projector, pretty solid shell, compact body weights 1KG only, projector size 22.5*15.2*9cm, smaller than iPad, supports projection size 32 to 120 inches from 4 feet to 8 feet distance. Easy to carry around, Perfect for backyard movie every weekend. Various Interface and 3.5mm Audio Port For Multimedia Entertainment. HDMI, USB, VGA, YPBPR inputs work with television, TV BOX, DVD, Laptop PC, USB driver, PS3/ 4, XBOX and Chromecast etc. Except dual build-in stereo speakers, you can also connect external subwoofer by the 3.5mm audio output. Just turn it on and connect them together, your home theater is ready to go. Projecting Your iPad Or Smartphone's screen By MHL Features. You can project your phone screen or the video from your iPad. Please make sure your phone has MHL feature, then connect a USB TO MHL cable, you would be ready to go. 100% Safe and 100% Satisfaction. Over heating protection system, the projector will turn off by itself when it is reaching maximum temperature. Any support needed, please don't hesitate to contact us. We take pride in our products quality and we provide a one year warranty.